We’re going green this week in anticipation of St. Patrick's Day this weekend. This Power Gulp is the perfect color for the day and is rich in iron and vitamin K for an energy boost. We’re going green this week in anticipation of St. Patrick's Day this weekend. This Power Gulp is the perfect color for the day and is rich in iron and vitamin K for an energy boost. If you still haven't jumped on the green juice bandwagon, what better day to try it? Along with tart Granny Smith apples, there's also healthy veggies. If you are having trouble getting your 3 to 5 fruit and vegetable servings a day, this recipe is for you. 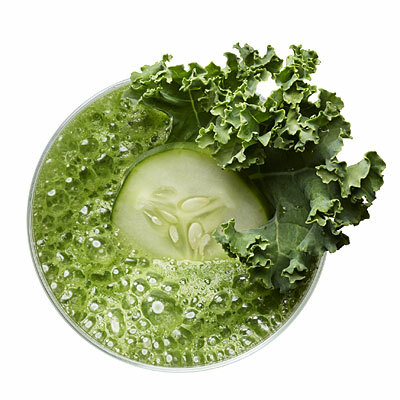 You get all the nutrients of kale, cucumber, and apples all in one glass…and it tastes good to boot! There’s no need for a fancy juicer (you can make this right in your blender) and if you want something a bit heartier, try adding ice cubes, plain yogurt, and a banana to make it a smoothie! So whether you make this juice as a morning boost or as a way to detox after too much revelry, you will definitely feel the luck of the Irish after enjoying a big glass of this Power Gulp!